With more than 50 years bushwalking experience between us, we've packed our bags for day walks and overnight hikes umpteen times. Over time, you get good at knowing the hiking essentials, plus what you can do without. This hiking checklist will save you a whole lot of time and hassle. We break it down into what to wear and what to pack. We assume you're beginner to intermediate and just need a simple explanation of the essentials. We spell out why we suggest certain items over others… it's great for the planning and preparation stage. Then to make it even easier when it comes time to pack your bag, download our simple day trip hiking checklist or the overnight hiking checklist. It's literally that – a checklist – to mark off as you go along. Comfort here is the key to enjoying your walk. Hiking boots should have good ankle support, heavy-duty grip and room for your toe to move forward inside the boot when walking downhill. If you want something lighter, a good pair of shoes will do fine. Hiking shoes with good soles are ideal but your running shoes will be okay too. The most important thing is they fit properly, are comfortable and are worn in. New boots or shoes create blisters if not worn in enough. You'll feel the difference wearing a reputable brand. Ian currently has Salomon boots and Merrell shoes; Tara only has Scarpa boots. Check prices of men's and women's hiking boots. This is one item where an in-store fitting is invaluable. Specialist outdoor stores usually have mini pretend hills so you can test toe wiggle room. Tip: Cut toenails before your walk to reduce rubbing and cuts. Thin cotton socks might seem like a good idea but they’ll get wet from sweat. Moisture causes friction and friction causes blisters. Likewise, thick woollen socks will be comfortable at the start of the day but may dampen. The best hiking socks are a merino, polyester and stretch nylon blend (both Ian and Tara wear these socks). They’re warm, breathable and wick the moisture away from your skin. They also fit snugly to your feet, reducing the chance of blisters. Pants designed for hiking try to strike the balance between lightweight, breathable fabrics, and being tough-wearing. Ian wears knee-length mens hiking shorts with a pair of Skins (lycra athletic shorts) underneath all year round. Check prices and see full range of men's pants. Tara wears either womens hiking shorts in summer or lightweight long womens hiking pants in winter. Browse the range of women's hiking pants and shorts. Using your existing wardrobe, go for either long-ish shorts (to stop bushes scratching your legs), or active-wear leggings. Denim jeans are never good hiking gear. Wearing a long sleeve shirt with collar provides better sun protection than re-applying sunscreen on your arms all day. Whatever you do, don’t wear a singlet. Exposed shoulders are asking to be sunburnt and rubbed by your backpack. In a pinch, grab an active wear t-shirt, rather than a bog-standard cotton t-shirt. Cotton, while breathable, also stays damp longer and keeps the wetness near your skin instead of ‘wicking' it away. We wear lightweight nylon-blend hiking shirts with collars that can be turned up on intense sunny days. They also have inbuilt UV protection and insect repellant. (We would've highly recommended our Macpac shirts to you, but they're not made anymore. In fact bush walking shirts are currently hard to find anywhere). ** UPDATE October 2018 ** We're selling Sydney Coast Walks logo-ed Macpac shirts for a very limited time. Once they're gone, they're gone. Lots of bargains with quality Macpac shirts and vests that are ex-uniforms (many “as new”). Plus ex-hire camping gear and more. Check out our very limited hiking and camping sale. Even if it's not winter, for a day walk a thermal base layer is lighter, more versatile and packs smaller in your bag than a bulky jumper. No longer sporting the garish stripes of yesteryear, Merino and polypropylene thermal base layers transition easily from bush walking to the rest of your life. We wear Merino all year round at home, around town and in the bush. It wicks moisture away from the skin, breathes well and is odour resistant. It’s perfect for hot or cold climates because it regulates temperature so well. It’s also really comfortable, not prickly and keeps its form better than polyprop (so doesn't get saggy baggy quite so soon). We live in it. If you were going to buy one item of clothing to walk in, buy a long sleeved Merino top. You can wear it nearly all year round walking in Sydney. Check out all your options for mens and womens thermal base layers. Tip: Merino comes in different ‘fabric weights' – the thicker, the warmer – ranging from 120gsm best for warm conditions, up to 380gsm for the coldest. You may be warm when moving but you'll cool down quickly when you stop, depending on the day's weather. A fleece (vest or jacket) is lightweight and warm. A down jacket is warmer and compacts well (but can become sodden if wet). This is a weather-dependent item of course, but err on the side of keeping warm. For a day walk, check the weather before heading off and only pack if required. A light spray jacket is adequate for a day hike; it can also be used as a windbreaker instead of a warm layer. Ian and Tara both only have proper rain coats, not spray jackets, because we find them more versatile for the type of walking we do. Yes, they were more expensive, but last for years because of relatively infrequent use. Check out mens waterproof jackets and womens waterproof jackets. Don't go out in the Australian sun for an extended period without one, ever. Ensure your mens hat or womens hat shades your entire face, covers the top of your head (not a visor) and preferably protects your neck too. The glare of a sunny day can give you a headache, especially if you're by the water. Wear sunglasses with polarised lenses if you can. A 20-25 litre capacity hiking daypack is plenty for a day walk. If you have a bigger pack, you’ll fill it with stuff you don’t need. Remember, you’re carrying it all day. Hydration bladders are best because you don’t need to stop to drink. Ian swears by his 2 litre Camelbak but a water bottle is fine too. Do yourself and the environment a favour and buy a re-usable stainless steel, hard plastic or aluminium bottle. We've got the whole family their own Nalgene On-the-Fly bottle – easy to open and close, nice to drink out of, and easy to clean. Tip: Take at least two litres of water per person per day, more in summer. A fresh stream or creek is like mother's milk on a hot day but it's best to play it safe and purify it before drinking. We use Micropur tablets because they eliminate more nasties than other brands, and are so much lighter to carry than a water filter. Read more about the best way to purify water while hiking. Energy bars, snacks and pre-made sandwiches or wraps are ideal for a day walk. Little snacks often are the best way to keep your energy levels up. Nuts and dried fruits – known as trail mix or scroggin – should always be on your hiking checklist. Muesli bars are great. You can’t beat a pack of lollies either. Pack it in, pack it out. Don't litter our beautiful bushland. Reduce the packaging on your food before you leave home to reduce the rubbish you'll need to carry out. Fancy GPS units are great… until the battery goes flat. Knowing how to use a map and compass and having them with you are still important. Multi function knives have uses you've never thought about until you need it. Ian loves his Leatherman Wave (check prices of multi-tools, including Leatherman). , ibuprofen for pain relief (it’s also anti-inflammatory); blister treatment and toilet paper. Check out the range of First Aid Kits designed for hiking trips. If you are going outside mobile phone range you should carry a PLB so you can be found in an emergency. Spot Trackers are great because as well as being a PLB, friends back at home can follow your journey. If you don’t have a phone (… what the?) and you want to record your journey. Just in case you aren’t back by nightfall. Headtorches are so much better than hand held ones. Remember spare batteries. Take a small tube with you and reapply every few hours. The backs of your legs will get burnt when hiking all day; don't forget to put sunscreen on them. Ian doesn’t like using insect repellent but Tara gets attacked by all manner of biting insects at dusk. DEET works well but isn’t super friendly on your skin. You need to know how you're tracking in relation to your finishing time. You also need to be able to call someone if you’re in trouble. Download the Emergency + app to identify who to call and give them your exact location. If you don’t take a phone, ensure you have a watch know how you're tracking in relation to your finishing time. The fancy GPS/tracking/altimeter watches are awesome… if you buy one make sure you learn how to use it properly! Take a second set of warmer, dry clothes to change into at the end of the day. Whether we are out for two days or ten days, we take one daytime pair of clothes and one nighttime pair. Wear the same clothes every day, except for socks and undies. Merino or thermal pants (mens thermals/womens thermals) are great to wear under hiking pants and wear multiple layers rather than one big one. You can easily take off or put on one layer if you are too warm or cold. Tip: Lay on your sweaty clothes overnight, between your sleeping bag and mat, to dry them. If they’re not too wet you can dry in the bottom of your sleeping bag overnight. This way they’ll be dry when you put them on the next day. It’s great to take your boots off at night. Thongs aren’t great because you can stub your toes in the dark. A pair of old trainers or the ever-stylish crocs are a winner. You’ll enjoy the nighttime for longer if you’re snug and comfortable around the fire. Beanies keep your head cosy and some womens beanies look pretty cool too. A good pair of gloves will make a huge difference to your evening enjoyment. For an overnight walk, keep the weather forecast in mind but tend towards packing a raincoat, as conditions can change. The only thing worse than being cold is wet and cold. Mens waterproof jackets and womens waterproof jackets are essential for extended hikes. Consider mens waterproof pants and womens waterproof pants too. A 65 litre pack is plenty for a bush walk of several days. If you have a bigger pack, you’ll fill it with stuff you don’t need. Remember, you’re carrying it all day, every day. Ian has had a Deuter Aircontact 65L pack for years, and loves it. Tara is rocking her Osprey Aura 50L pack when Ian carries the tent! If your pack doesn't have an inbuilt rain cover (usually stored in a pocket on the bottom of your pack) put all your gear in a pack liner inside your pack. No-one likes wet gear. If rain is forecast, check out these video tips for hiking in the rain. If it’s heavier than this, with a vestibule and all the bells and whistles, it’s probably not a good hiking tent. Remember if it gets wet from rain or even morning dew, it’s going to feel heavier! You pay for what you get in tents. As a rule, the cheaper; the heavier. An unbelievably cheap tent from a department chain store will not withstand the slightest breeze or drop of rain. No need for a really expensive tent when you're starting out; mid-price should be fine. Warmth to weight ratio is important. If that extra kilo of weight is going to be the difference between being warm and sleeping or cold and awake, it is worth it. Make sure it compacts down to the size of a basketball, at most. You don’t want your sleeping bag to take up all the space in your pack. Synthetic sleeping bags are much cheaper but aren’t as compact as down sleeping bags. Down is so much warmer and lighter, hence more expensive. We each use a Sea to Summit Talus TS1 down bag. They’re super warm, comfortable and compact for our needs in Sydney. Check out the Sea to Summit range of sleeping bags. Choose a sleeping mat with a good comfort to weight ratio. Foam mats are super light but they’re very bulky and don't have the comfort of a self inflating mat. We each use a Sea to Summit Comfort Light Insulated mat. Even as a side sleeper, the Comfort Light mat is a dream. It's a world away from my first Thermarest 20+ years ago, so if your last sleeping mat experience is as ancient as that, it's absolutely worth checking out the Sea to Summit range. Tip: Don't bring a pillow, not even an inflatable hiking one. Put your jacket or spare clothes inside your sleeping bag cover. Save the pillow for car camping. We always recommend cooking a hot meal at night. A hot drink can also change a cold morning into an enjoyable experience. There are two main types of hiking stoves. One that burns methylated spirits and another that burns propane/butane. We recommend Trangia stoves if you're starting out. They burn methylated spirits, which is available in supermarkets, and are more stable than other hiking stoves. Butane stoves are much lighter and boil quicker but are more unsteady. Fuel canisters can only be bought in camping stores. Ensure you have the correct fuel for your stove and take enough for an extra day. Remember, a stove doesn’t work without fuel! One good pot can be everything you need to cook with and eat from. Look for a good cookware set when you buy your stove. Once again, one tool – like a spork – can be everything you need. Think about what food you've packed – do you need a sharp knife, can you do without a fork? Consider freeze dried meals for longer hikes. They’re more expensive than packet pasta/rice from the supermarket but taste much better. Don't be too elaborate with your meals. The more complex your meals, the more cooking and eating utensils you need and the longer it takes to cook. Allow enough food for an extra day and reduce all your packaging. Take packets instead of cans. Cans are heavier and you’ll need to carry out the dirty, sharp empty cans. Tip: If you have the space and can handle the weight, take a frozen bolognese for the first night. It will defrost on the trail and you'll be lighter the next day. The ritual of boiling the kettle at the door of your tent is a hiking and camping delight. Don’t throw your teabag into the bush. The leaves might be organic but that bag will be an eyesore for a while before it breaks down. Has this Overnight Hiking Checklist helped you? Use these Bushwalking Resources to find out more. Still need somewhere to go? 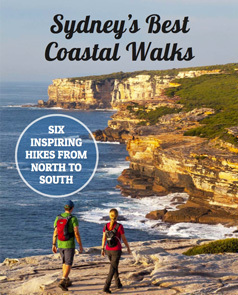 Choose from a list of best Sydney walks.